A recent story in the Washington Post confirms that chickenpox cases are on the rise in North Carolina. At the Asheville Waldorf School, 36 infections of students between nursery school age and sixth grade were reported. The outbreak is the worst in North Carolina since the two-dose chickenpox vaccine became available approximately 20 years ago. Today few people get chickenpox, compared to almost 90% of Americans before the vaccine become an option. Most young school age children nationwide get a two-dose treatment. The Centers for Disease Control and Prevention estimates that “the percentage of children under 2 years old who haven’t received any vaccinations has quadrupled since 2001,” the Post reports. The Asheville school, according to the Washington Post article, does make immunization a requirement for its young students (as does the entire state of North Carolina). Kindergarten aged children are also required to get vaccines for measles and the mumps. The vaccines are given a second time when the child enters the seventh grade. However, there is a greater number of students whose parents refuse to vaccinate based on religious beliefs, an exemption which North Carolina allows. Asheville Waldorf is a private school. Its rate of religious objections to vaccinations in the third highest school rate in the state. The Post story referenced another journalism story reported by the Citizen-Times which reported that 110 of 152 students at Asheville had not received the chickenpox vaccine. Jennifer Mullendore, the medical director of Buncombe County, N.C., was unambiguous: “We want to be clear: Vaccination is the best protection from chickenpox.” The CDC states that chickenpox is a life-threatening disease which especially affects babies, adolescents, women in pregnancy, and people with immune systems that are weak. Chickenpox is caused the varicella zoster virus. The disease can create intense rashes on the stomach, face, and back as well as the rest of the body. The disease can be spread before the signature rash appears. 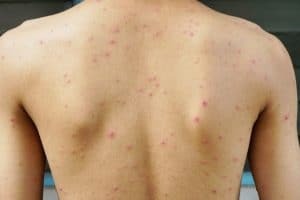 Can you sue if your child develops chickenpox at school? In a word, no. Parents who opt out of having their child vaccinated for religious reasons, or on the advice of a doctor, are generally free from legal risk of liability. We urge you to vaccinate your children, if you can. When more children are vaccinated, it can help protect medically fragile children (and adults) who are unable to be vaccinated. The Charlotte personal injury lawyers of Warren & Kallianos, PLLC represent victims of negligence throughout North Carolina. If you have been hurt by another person’s actions, we may be able to help. Please schedule a free consultation by calling 704-275-5593, or by contacting us today.